Nozomi Yumehara is an eighth grader attending Cinq Lumieres Academy. One day, Nozomi finds a mysterious book called the "Dream Collette" in the library, and meets a creature named Coco from the "Palmier Kingdom." After saving Coco he decides to give Nozomi a "Pinky Catch," which allows her to transform into Pretty Cure! 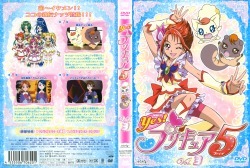 Together with her four partners, Pretty Cure will fight against evil ambitions with team action! An eighth grader at Cinq Lumieres Academy. An emotional, cheerful, and energetic girl. Her grades and athletic ability aren't very good, but she's brimming with curiosity, and despite her blunders is always optimistic. 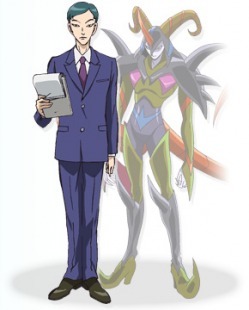 The leader of Pretty Cure, and the glue that holds the other members together. Her catchphrase is "It's decided! (Kettei!)" A beauty stylist who runs a salon called "Espoir." Seems to have it together, but used to be more scatterbrained than Nozomi. Intro Speech: "Pretty Cure...Metamorphose! Ooi naru kibou no chikara - Cure Dream!" "Yumemiru otome no sokojikara ukete minasai! 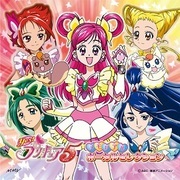 Pretty Cure Dream Attack!" "Yumemiru otome no sokojikara ukete minasai! Pretty Cure Crystal Shoot!" An eighth grader at Cinq Lumieres Academy. Boyish and skilled at sports. 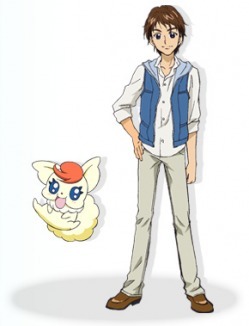 Has a bit of a masculine personality, but is still girlish overall. Has been Nozomi's friend since kindergarten, and consequently always has to get Nozomi out of the trouble her curiosity leads her into. Runs a flower shop called "FLEURISTE NATSUKI." Childhood friends with Nozomi's mother. Full of mischief, and Rin has difficulty with him. But also has a kind side that loves his sister. Full of mischief, and Rin has difficulty with her. But also has a kind side that loves her sister. Intro Speech: "Pretty Cure...Metamorphose! 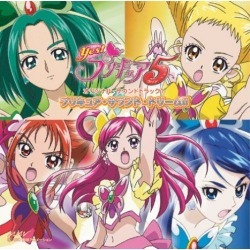 Jounetsu no akai honoo - Cure Rouge!" 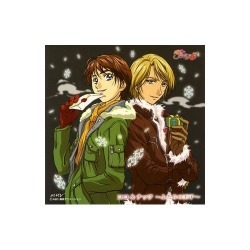 "Junjou otome no honoo no chikara ukete minasai! Pretty Cure Rouge Fire!" 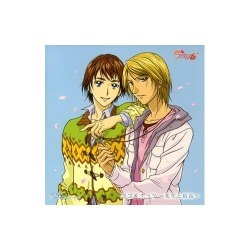 "Junjou otome no honoo no chikara ukete minasai! Pretty Cure Rouge Burning!" A seventh grader at Cinq Lumieres Academy. When not at school, works as a budding new actress. Though she looks childish, she acts mature and thoughtful in public, and can put on a professional smile even when in pain. A renowned actress. Her curry recipe is beloved among the family. Has lived in Japan after moving from France 20 years ago, and is fluent in Japanese. Responsible for her during work hours. Intro Speech: "Pretty Cure...Metamorphose! 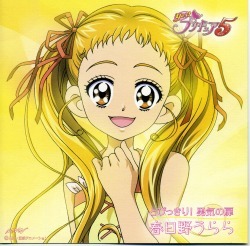 Hajikeru lemon no kaori - Cure Lemonade!" "Kagayaku otome no hajikeru chikara ukete minasai! Pretty Cure Lemonade Flash!" "Kagayaku otome no hajikeru chikara ukete minasai! Pretty Cure Lemonade Shining!" A ninth grader and member of the library committee at Cinq Lumieres Academy. Has an easygoing tone and gentle personality. Always puts a smile on her face, but is very frightening when angry. A bookworm, and an expert when it comes to stories and legends. Karen's best friend. Nearly identical to Komachi. A college student. Looks cool riding a big motorcycle, and the others look up to her. Intro Speech: "Pretty Cure...Metamorphose! 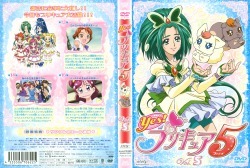 Yasuragi no midori no daichi - Cure Mint!" "Daichi o yurugasu otome no ikari ukete minasai! Pretty Cure Mint Protection!" "Daichi o yurugasu otome no ikari ukete minasai! Pretty Cure Mint Shield!" A ninth grader and student council president at Cinq Lumieres Academy. Gifted with both looks and smarts, and all the other students admire her. Tends to hide her emotions, and is the type who doesn't let others see her weaknesses. Her family is very wealthy, and she lives in a huge mansion with a butler. The butler of the Minazuki mansion is Karen's sole caretaker while her parents are away. Intro Speech: "Pretty Cure...Metamorphose! 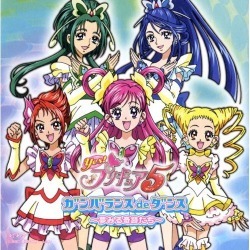 Chisei no aoki izumi - Cure Aqua!" "Iwa o mo kudaku otome no gekiryuu ukete minasai! Pretty Cure Aqua Stream!" "Iwa o mo kudaku otome no gekiryuu ukete minasai! 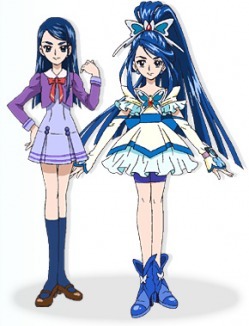 Pretty Cure Aqua Tornado!" Intro Speech Finale: "Kibou no chikara to..." "Mirai no hikari! Karei ni habataku itsutsu no kokoro!" "Yes! 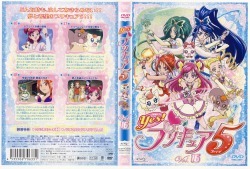 Pretty Cure 5!" "Yume to kibou no chikara to tomo ni..." "Itsutsu no hikari o ima koko ni!" "Pretty Cure Five Explosion!" From the Palmier Kingdom. 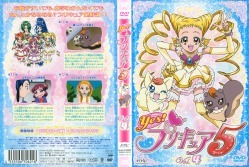 To complete the Dream Collette, he carries the duty of capturing Pinkies with Pretty Cure. Can take on the form of a human, and acts as a teacher at Cinq Lumieres Academy. Ends sentences in "coco," except in human form. From the Palmier Kingdom. Guardian of the Dream Collette, and in charge of caring for the Pinkies. Can take on the form of a human, and runs a general store called "Natts' House." Ends sentences in "natsu," except in human form. One of the members of Nightmare hired to take the Dream Collette in order to grant Despariah's wish. 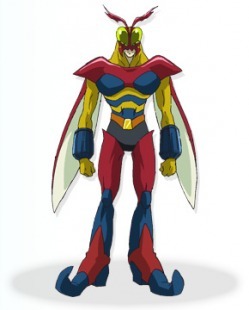 Attacks with his sharp sickles like a praying mantis. One of the members of Nightmare hired to take the Dream Collette in order to grant Despariah's wish. Uses his long tongue like a frog as a long-range weapon. Acts as a troublesome spy in all his actions. One of the members of Nightmare hired to take the Dream Collette in order to grant Despariah's wish. 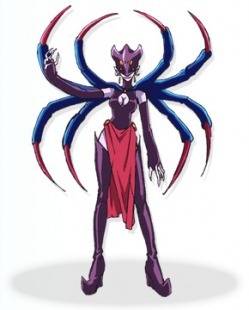 Shoots threads from her spider-like body to trap her opponents. One of the members of Nightmare hired to take the Dream Collette in order to grant Despariah's wish. Moves swiftly like a bee and shoots sharp needles from his arms. One of the members of Nightmare hired to take the Dream Collette in order to grant Despariah's wish. Acts as a substitute for the unseen Despariah, and hands down commands to Nightmare. When transformed, is able to attack and block with his two large tails. Caretaker apprentice of Coco and Nuts. Ends sentences in "miru." One of the members of Nightmare hired to take the Dream Collette in order to grant Despariah's wish. Frequently wears lipstick. Can fly into the sky like a bird and attack with wing-like extensions from her palms. One of the members of Nightmare hired to take the Dream Collette in order to grant Despariah's wish. Can fly into the sky like a bat and attack by shooting sonic waves from his wings. Kawarino's superior. To grant her wish of eternal youth so she can create a world of eternal despair, she has set her sights on obtaining the Dream Collette. Her servants of Nightmare work to defeat Pretty Cure. 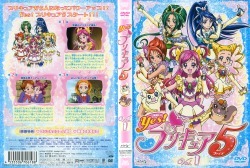 A new Pretty Cure series begins now! Nice to meet everyone! Nozomi is in eighth grade. Nozomi encounters Coco, whose hometown Nightmare took away. Nightmare is an organization bent on making this world a world of despair. 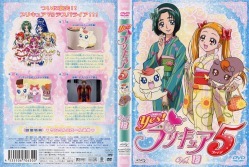 Nozomi wishes to fulfill Coco's dream of restoring his hometown, and a strange power transforms her into Cure Dream. The legendary Pretty Cure warrior is born! To fulfill Coco's dream, besides Nozomi and Rin, three Pretty Cures are needed. During lunch, Nozomi and Rin are chatting, when Urara comes. Urara says she saw them transform and fight. What to do! Nozomi takes Urara, who says she's always alone at school, and shows her around the campus. At that point Gamao from Nightmare appears, and they're attacked. At that time Urara...! With Nozomi, Rin, Urara, and Komachi, there are now four Pretty Cures. They need one more to grant Coco's wish. 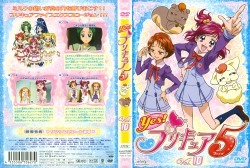 So again they ask Karen, who has left the student council meeting, to be a Pretty Cure. But she really doesn't believe the whole Pretty Cure thing. At that point a Kowaina appears, and Nozomi and her friends are attacked. Each one transforms into Pretty Cure, and seeing this scene, Karen finally decides she wants to be a Pretty Cure. 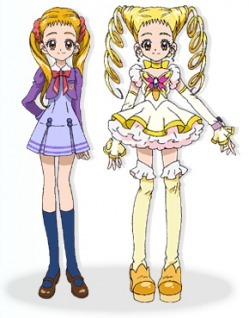 All five Pretty Cures are gathered except Karen. 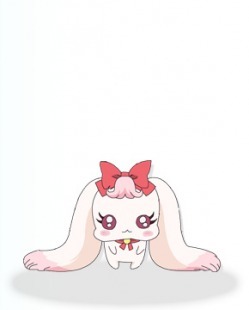 Although she wanted to be a Pretty Cure in her heart, surprisingly she wasn't able to... but they didn't think the gentle Karen wouldn't be able to be a Pretty Cure! 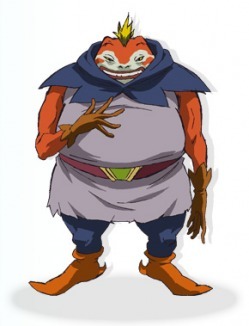 At that time, Bunbee appears, and he transforms a Pinky into a Kowaina and attacks them. 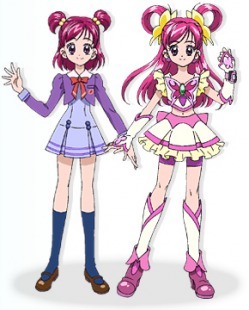 Overlapped with the appearance of a Pinky, Pretty Cure can't attack. Karen, at that instant, feels she wants to be everyone's power for the first time. And then...!! Rin, able to do any sport, is participating in several sports team, but all of this year's tournaments take place on the same day, so she can't do all of them at once. Rin is interested in futsal, but if she joins the futsal team, she won't be able to help out at the shop, and she'll worry about her younger siblings. Going to talk about it with Nozomi and her friends, Gamao appears and attacks her! Nozomi's mother has caught a cold. Nozomi enthusiastically does her mother's chores, but she only makes mistakes, ruining the dishes and breaking the washing machine. Then Rin's mother comes to make dinner for her. She straightens up the untidy kitchen, too! Nozomi admires her flawless work. Nozomi is enthusiastic, too, and goes to the supermarket to make her mom's favorite egg porridge. At that point, Gamao and a Kowaina appear! While Nozomi is heading to school, she finds a super-cute plush toy, but after school, while she's eating bean daifuku and Natts' House, the plush toy she found bites into her daifuku and says it's delicious! The plush toy is from the Palmier Kingdom, and in charge of taking care Coco and Nuts; her name is Milk. Everyone is shocked to learn that Coco and Nuts are princes! Milk escaped when Nightmare attacked the Palmier Kingdom, and spent her time in the human world pretending to be dogs or cats. After the reunion, Milk goes out to buy food for Coco and Nuts, and is attacked by Girinma! Coco and Nuts are both driven into a corner! 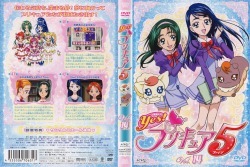 Nozomi and her friends come running as well, and fight as Pretty Cure...! Today is the day of Natts' House's bargain sale. Nozomi and her friends have come to help Nuts out! But Milk tells them they don't have to help if they don't want to. Milk says she can help all on her own, but when they first see this they're only worried. Furthermore, afterwards when Milk sits on the merchandise shelves like a plush toy, the customers try to buy her. After being bought, Milk secretly runs away, thinking if she pretends to be a plush toy at Natts' House again, they'll make lots of money, and Coco and Nuts will think of her as a big help. With Coco and Nuts angry about what she did, Milk is dejected...and runs away. Then Arachnea from Nightmare captures her and things get dreadful! Nozomi and her friends, who were worried about Milk and came searching for her, come running after! Today everyone is gathered at Natts' House, and making a sculpture out of beads! They're going to put the beads on a wire. While they're working on it, Nozomi and Milk create lots of noise as they scramble. As a result, the sculpture is broken! Even though everyone worked so hard on it... Everyone is put in a bad mood. The next day, everyone is still in pieces. Nozomi decides to reconcile Rin and her friends. But after school, Girinma appears, and Rin, Urara, Komachi, and Karen are kidnapped! Nozomi learns that everyone has been captured by Kawarino from Nightmare, and Coco and Nuts are heading toward the Nightmare headquarters together to save the four...! To save Rin and her friends, who have been kidnapped, Nozomi, Coco, and Nuts have gone to Nightmare's headquarters. Then they see Rin and her friends covered with the "Mask of Despair," absolutely unable to be freed. And just when Nozomi transforms into Dream, the Mask of Despair is forced onto her! The five girls fall into an ominous pit...when they regain consciousness, they're in a parallel world. Forgetting the painful reality, they're immersed in a pleasant, quiet world. But Nozomi remembers reality with the jingling keychain Coco made. She can't just have fun; she should work hard now for the future! With that, Dream's mask is broken! Dream and her teammates succeed in escaping the parallel world, and the five are granted a new power...! Summer vacation starts today! Nozomi has special plans for a Pretty Cure boarding vacation! Rin and her friends write out the vacation plan in a notebook, but Nozomi can only think about snacks. When everyone's talking about where the vacation should be, they find out Karen has a villa. With that, the vacation's location is decided! The next day, the five go shopping for the trip, when suddenly the lights in the shop go out. It's Arachnea's doing. They quickly transform into Pretty Cure! But they just can't seem to defeat her... Then a dazzling light comes out of the bow on Dream's chest...! Starting today, Pretty Cure is staying at Karen's spectacular island villa! While they're playing, they go shopping for ingredients for dinner. Nozomi, Rin, and Urara are engrossed in picking up fish! Meanwhile, Komachi is on a walk looking for ideas for her novel. In the middle of this, she suddenly bumps into Nuts, who's resting to enjoy the nice breeze. At that time, Nuts smiles, telling Komachi that he can relax when she's with him. Komachi becomes rather anxious hearing this. That night, Nozomi and Cocoda search for lost things on the beach after dinner. And while they're talking, they come closer to each other... But suddenly Gamao appears, and Nozomi and her friends are attacked by the ocean turned Kowaina! Watching the Kowaina devastate the island, Komachi takes action...! Rumors are going around that there's a ghost at Cinq Lumieres Academy. Long ago, the ghost was Count Roset, who owned a mansion here. He lost his love in an accident, and remains dwelling in sorrow. And every year on the day he lost his love, he gets lost walking and searching for her. Today is that anniversary! Nozomi and her friends are curious, and sneak into the school at night! But during this, Rin, the most easily scared of the five, gets lost from them. Moreover, the ghost of the count suddenly appears! Then the count gives Rin a rose hairpin. It seems he's mistaken Rin for his lover. She tells Komachi, and when the count appears again, Arachnea and a Kowaina appear...! A summer festival is held every year at Komachi's house, which doubles as a confectionary. This year Komachi thinks she should sell special snowcones! With sweet bean jam, bean-fruit, and bean paste chosen, they seem like really good snowcones. But on the day of the festival, the ice she's received is all eaten by Gamao! The flustered Komachi orders the ice again, but there isn't any time... She's about to give up, but Karen persuades her otherwise, and the two phone a bunch of manufacturers. But they can't find a company that's saved any ice. At that time, upon Nozomi's suggestion, they substitute mandarin oranges for ice and make fruit a la mode! But Gamao appears to interrupt them again...! Summer vacation is almost over, but Nozomi still hasn't done her research homework! Urara invites the hurried Nozomi to come with her to where she works. If she does that, she might find a theme for her research project! First up is a concert at an amusement park. As she wanders aimlessly, Nozomi is mistaken for Urara's manager! Unable to perform on keyboard, she hurriedly calls Karen to play, and the concert is a big success. Next is a photo shoot at a historical village. Even there, Nozomi does a great job substituting as manager! Using Rin and Komachi's talents, the photo shoot progresses smoothly. Morever, Rin, Cocoda, and Natts participate as extras. During all this, Bunbee appears to disturb the photo shoot...! One day, Nozomi and Milk get in a big argument over chocolate! Quarrelling with things like "Milk doesn't seem like caretaker of the Palmier Kingdom!" and "Nozomi isn't fit to be a Pretty Cure! ", the fight escalates. But afterwards the two really regret it... Milk is persuaded by Karen to reconcile with her. And when the worried four go to Nozomi's house, Arachnea appears there to interrupt! Rin and her friends suffer from the violent attack, and the Dream Collette is taken away. Then Nozomi appears! Somehow she succeeds in taking back the Dream Collette, but Arachnea's power increases. Pretty Cure's attacks no longer have any effect, and they're stuck! At that time, a change takes place in Milk...! Nozomi sees that Cocoda is receiving love letters from schoolgirls. She's shocked to see him accept them with a kind smile! "Why are you smiling?!" Furthermore, he's already received a lot of love letters, and he's replied to all of them. Nozomi, who hadn't heard this before, is sad that Cocoda would keep a secret from her, and dashes off to Natts' House. Cocoda is bewildered, but decides to tell Nozomi how he really feels. Meanwhile, Nozomi tells Rin she wants to make up with him, too. But at that time, Hadenya, a new enemy from Nightmare, attacks Coco and Nuts. The Dream Collette is taken, too! Then Nozomi comes running, and seeing the worn-out Coco, stands up in anger...! Karen has bought a horse to keep at home, and can now practice horseback riding! Nozomi and her friends are shocked at how elegant Karen looks straddled on her white horse! At that time, Milk catches fever. Only a Pinky called a Cappy can cure her illness. Nozomi and her friends immediately go to search for the Cappy! Meanwhile, Karen undertakes nursing Milk, with Jiiya teaching her how to handle the fever, and kindly takes care of Milk. At that time, Hadenya appears, and a bunch of bugs gathered into a Kowaina attacks them! Karen is determined to protect Milk, and transforms into Cure Aqua, but she's defeated by the enemy's attacks... But then Karen's white horse approaches her! Aqua stands up once again with the help of the horse's strength...! Coco is getting fat! It seems he's eaten too much of his favorite cream puffs. His caretaker, Milk, and Nozomi and her friends are worried that Coco is unhealthy, and forbid him from eating cream puffs. Milk thinks of a balanced dinner for Coco, but he's downhearted not being able to eat cream puffs, and doesn't have any energy... Nozomi and her friends also try to cheer him up by cooking for him, but they can't peel the apple's skin very well, and fail in adding jam to the porridge. Then one day, Cocoda finds a cream puff sale! "I want to eat them!" However, it's a trap by Hadenya, but Coco doesn't realize it, and is about to eat the cream puff given to him... But at that time, Nozomi and his friends worrying about him come to mind, and he quickly stops himself! Then Hadenya reveals her identity...! Milk borrows a Cinderella picture book from Komachi to write a novel. She transcribes the story of Cinderella, studying the writing style! Milk immediately begins writing secluded in a room alone, and thinks of what should happen. She decided to change the story of Cinderella a bit! Once upon a time, there lived a Cinderella just like Nozomi, her cruel mother who looked like Komachi, and her older sisters who looked like Rin and Karen. One day, they open an invitation to a party at the castle, and only Cinderella stays home...then a witch who looked like Urara appears, and presents to Cinderella a beautiful dress and glass slippers. Cocoda is the prince at the party. But Cinderella falls over too much...while she's writing the story this way, Nozomi comes to see what Milk is doing. She doesn't want it to be seen, and goes outside Natts' House, but then Bunbee appears and takes her novel...! It's a nice, clear autumn day. Nozomi is on a walk with Cocoda and Natts to catch Pinkies. During this, a female reporter wants to take pictures for a magazine, and points a camera toward them! Natts clearly refuses, but Cocoda is okay with being photographed. But when the reporter treats Nozomi as an annoyance, Cocoda also refuses. Nozomi is a bit anxious seeing that side of him. That afternoon, they look out over the town on top of a hill. It stirs up talk about memories of the Palmier Kingdom, but Natts leaves so Nozomi and Cocoda can be alone. Cocoda might say something to Nozomi to clearly tell her how he feels. The two's eyes meet, and Nozomi's heartbeat accelerates...then the figure of Despariah appears! Komachi is worried about the novel she's writing right now. In the final scene, a certain girl separates with the boy she loves. At that time, the young girl tells him her feelings even though she doesn't want to... But is this okay? She wonders if it'll be an annoyance in the boy's future if she tells him how she feels. Komachi is even absent-mindedly worrying in school. Karen gives her advice on what she should do so she won't feel regret afterwards. Even at Natts' House, Nozomi and her friends try to advise her, when Natts steps up to her. 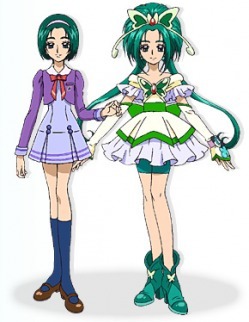 The girl and boy are actually based on Komachi and Natts. Komachi decides in her heart not to do something she'll regret. She gazes at Natts... But at that time the figure of Hadenya appears! Milk is isolated by herself at the park. Urara notices her as she's leaving Natts' House and greets her. However, Milk bursts into tears. She's worried she's not fit to be Coco and Nuts' caretaker. Milk asks everyone what the ideal caretaker is. Urara says it's someone by the person's side during important times. Rin says it's someone who works for everyone. Komachi says it's someone who has motivation. Karen says it's someone who doesn't forget what she believes in. All these apply to Nozomi. Milk understands she can't be as "ideal" as Nozomi. At that point she asks Nozomi, who says the ideal caretaker is "someone who plays a lot, eats a lot, and is full of happiness." Milk is disappointed by Nozomi's answer. An unpleasant mood develops between the two. At that time, Coco and Nuts, who went searching for the disappeared Milk, are attacked by Nightmare...! During the New Year, Nozomi and her friends all do their first shrine visit of the year at a nearby shrine. Of course, everyone wishes for the restoration of the Palmier Kingdom. Thanks to everyone's hard work, they only need one more Pinky to have gathered the 55 in the Dream Collette needed to do so. They go to the park expecting the search for the last Pinky to be difficult, but it appears on Nozomi! They can't believe it! With this they're all complete! After it's put into the Dream Collette, everyone's wish will be granted! But then Bloody appears, and changes the park into a Kowaina and attacks them! Bloody is tough, but Pretty Cure is able to win by combining their power. Everyone's relieved, and finally put the last Pinky into the Collette. But at that time, a Kowaina posing as Cocoda appears...! The people of the Palmier Kingdom have been awakened! But with attacks by a bunch of Kowainas, Dream has been consumed by one. The unconscious Dream is caught and taken by a fake Cocoda. But the fake Cocoda has thrown Dream away! Even having obtained eternal life, Despariah's anxiety won't go away, and no matter what happens Dream still won't give up hope. "Why won't you give up? Aren't you scared?!" Dream answers. "It's okay. Because my friends are here." At that time, Kawarino suddenly appears and attacks Dream, but Despariah stops him. "What should I do if they have hope? Even though I've overtaken the world with despair, I just feel empty..." Hearing Despariah's words, Kawarino is... And the hole of despair gets bigger. I'm Nozomi Yumehara! I'm doing my best being a Pretty Cure~! My partners are my best friend Rin-chan, idol Urara, and my amazing upperclassmen Komachi-san and Karen-san. Our five personalities are different, but our hearts are one! We set out to a theme park called "Wanna Be a Princess~?!" Fully enjoying the princess atmosphere, we're wearing frilly~ cute dresses in a gorgeous castle, Coco and Nuts are dressed up as nobles, and the people around us are so excited! We're totally oblivious to the fact that these aren't the original princes of the Palmier Kingdom, and Coco and Nuts have been abducted to the Land of Mirrors!! The offenders are Migirin and Hidarin from the Land of Mirrors. The truth is, they were manipulated by a villain named Shadow. 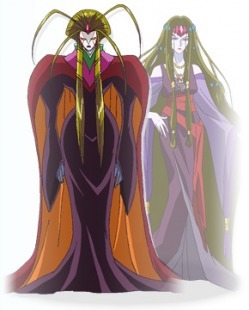 Shadow plans to use the Crystal, the precious jewel of the Land of Mirrors, to take away the Dream Collet and rule the world! We have to hurry and save Coco and Nuts! 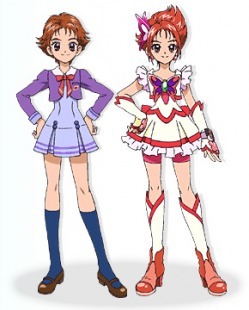 However, facing the Land of Mirrors, somehow a Pretty Cure looking exactly like us appears??? Wait, wait, wait~! 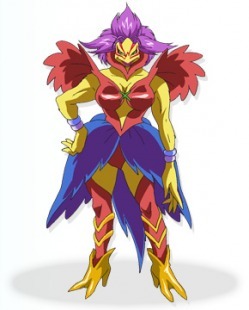 What on earth do you mean we have to fight this Pretty Cure? 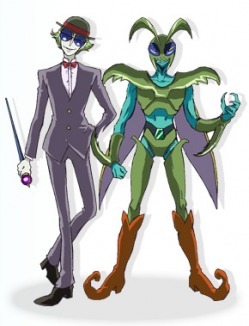 Moreover, they combine their powers with Shadow's power to create the strongest enemy!! Pretty Cure is in a big, big, big crisis~!!! With the Miracle Lights you all have, you can lend us your power!!!! So that we can power-up!!!!! 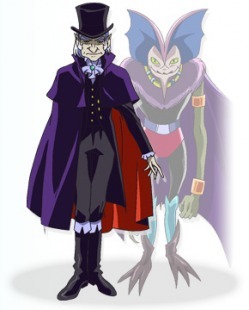 Dark Pretty Cure 5: Shadow creates them from the power of the Crystal. They never feel fatigue, nor the heart of friendship. They fight while taking direct advantage of the real Pretty Cure 5's weak points. 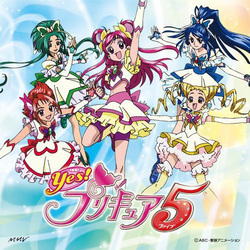 Pretty Cure 5, Smile Go Go! / Kirakira Shichatte My True Love! Yes! 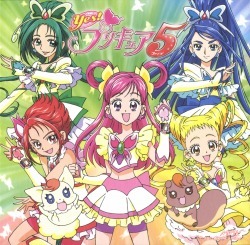 Pretty Cure 5 Theme "Pretty Cure 5, Smile Go Go!" Yes! 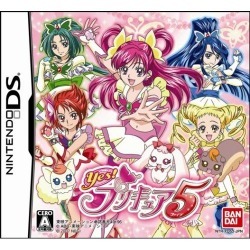 Pretty Cure 5 Vocal Best!! Yes! 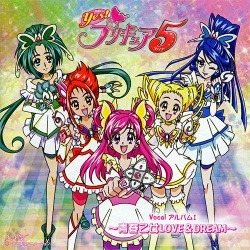 Pretty Cure 5 Original Soundtrack 1: Pretty Cure Sound Dream!! 17. Itsutsu no Kokoro! (Five Hearts!) 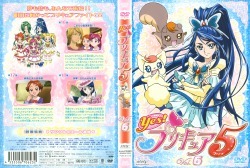 Pretty Cure 5!! Yes! 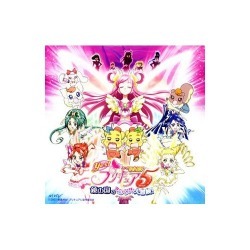 Pretty Cure 5 Original Soundtrack 2: Sound Miracle Shoot!! 29. 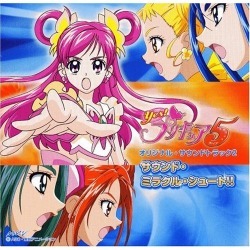 Pretty Cure Five Explosion! Eiga Yes! 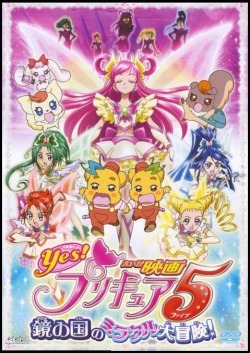 Pretty Cure 5! 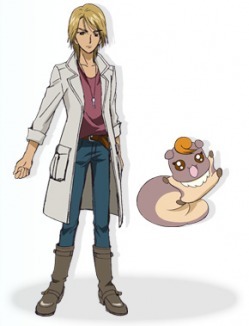 Kagami no Kuni no Miracle Daibouken! 24. Super Pretty Cure Five Explosion! "Yes! 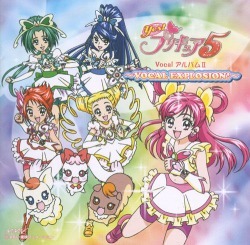 Pretty Cure 5 Memorial Vocal Selection"
1. 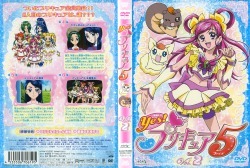 Pretty Cure 5, Smile Go Go! 6. Kirakira Shichatte My True Love!